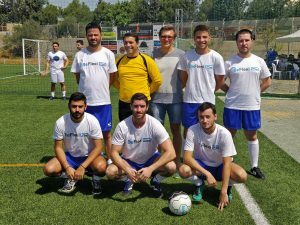 This weekend, the BeFlexi team proudly joined forces with other local companies in aid of the ALMA Foundation, a center for the early intervention of premature babies and young children with mental and physical developmental impediments. The activity: football, of course! On Sunday 20th May, seven of our players braved the sweltering heat and took part in the Charity Mini-Football Tournament, organized by Intership Navigation Co. Ltd. The BeFlexi football team with team sponsor, Sergey Galin (center-back). Since our inception, BeFlexi has appreciated the importance of being an active member of not only the local community, but also the Cypriot corporate network. We strive to give back to the community that hosts us wherever possible and especially help support the significant work of charities, such as the ALMA Foundation. The day was an excellent opportunity to also meet our fellow associates from other companies, such as KPMG, Deloitte, MSC and Columbia Shipmanagement, and display some good teamwork and football play. BeFlexi thanks Intership for the excellent organization.